A walk back into the history of the season. I had this buck and three of his companions under my tree on October 15, what used to be the original first day of archery season. This year archery started on the 16th, I had a decent 10-point at 10 yards the first morning and due to brush I had no shot. I actually I wasn't real upset because I knew the big 8 was there also. The abnormal amount of SW wind the first week and a half was playing havok with me, making most of my good stand sites unhuntable. I learned the hard way "not" to push your luck. The motto of, forget the wind - just hunt, is "not" a motto to live by! While you can cut down greatly your scent, you will "never" be 100% scent free, and some bucks only need one whiff and your all done! I didn't hunt my good sets the last week of October so they would be good and fresh for the first week in November, when deer should really be getting cranked up. I am a firm believer in don't push it till the time's right! I saw some good bucks the first week of November and was doing all day sets the 1st, 2nd, 3rd, and all but an hour or so the 4th. On the 4th about 4:45 it was really raining, and I had taken my arrow off the string, when a doe and two little ones blew by me. I thought someone had gotten out of a stand and spooked them. Then, five minutes later that big 8-point walked right under me and all around me, but I wouldn't tempt fate in the rain. I knew then and after that not taking the shot in the rain was the right choice, but man it was eating me up inside!! 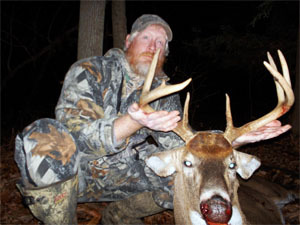 I know that most times you may only get one good chance at a particular mature buck. I was trying to convince myself that he had no clue that I was there, and that I'd get to see him again. It was pouring rain the next morning so I didn't hunt. I just packed the truck and headed for camp in PA at noontime. That whole trip I kept replaying the previous nights hunt and wondered would he chase a doe off onto another property and get shot, or worse yet, get hit by a car like so many other bucks have met their demise. I had planned to be in PA most of a week, but Saturday morning I was on a very familiar ridge and as usual there were bucks there. I shot a nice 12-point after being in the tree four hours. Now it was decision time, I had some work to do at the farm, but I just couldn't get that NY buck out of my mind. Monday morning I caped out the 12-point, did the butchering, closed up camp and came back to NY. Tuesday morning, the first buck I saw was the big 8-point! I knew Wednesday and Thursday were gone as I had work to do, and the break wouldn't do any harm. Saturday evening, I had him again at less than 10 yards, but being buried in a hemlock at last light I just couldn't see my pin. Sunday morning there was hard SSE wind, the worst wind for my hot stand, so I took the morning off. After showering and getting ready for the evening hunt, the wind picked up. Not going, wind died, weather channel said less than 5mph wind, I am going! Got all my stuff together and it started sprinkling. That's it! Take off the gear and don't push it! On November 15th, I went outside at 4:30 am and it was dead calm. I showered, got my gear together, and headed off to the woods. I slipped in quietly as the leaves were nice and wet from the heavy showers Sunday night. I was all settled in the stand. At 7:30 I heard a grey squirrel scolding a deer, I pinpointed the squirrel and some movement. Antlers! NICE antlers! There he is! He walked North of me about 30 yards out, then turned South and came right at me. He was walking head drooped, eyes about shut, just plain whooped from chasing all night. He got to ten yards, but no shot. He turned West and stopped in an opening, but his entire chest was behind a beech tree and all I could see was from his last rib to the tail. He trashed a small beech tree, took two steps and was covered with beech brush on his vitals. He proceeded to make a scrape and licking branch, then did his urine deal. He walked ten feet and literally plopped down. I mean standing on all fours one second, then crashing to the ground 20 yards down wind and lights out! Asleep!! I couldn't believe it, this buck was bedded 20 yards from me and no shot! He slept for an hour until a young doe walked through, then he snapped awake and jumped up and chased her out of there. Then he slowly walked up the hill until he heard another buck grunting and chasing that young doe in the brush. Suddenly, he was off to the races trying to run off that other buck. I only hunted until 10 o'clock because of a noon-time appointment. Later, I took a very slow walk to the stand. It had warmed up and the leaves had dried quite a bit so it was noisy. I got to my hemlock without spooking any deer and sprayed everything down. I just had that feeling that this was going to be the night! I even sprayed the climbing stick as I was going up the 30 feet! I had that feeling all day and I paid extra care to my scent control. It was WARM! I thought, "Man, I just cant catch a break!" 2:00 nothing, 3:00 nothing, 4:00 nothing! Finally the sun got behind a western hill and you could feel the temp dropping! At 4:30 I heard a deer to the northeast coming my way. It stepped out and it was a decent 8-point..but not him! The buck walked by at 10 yards in the open. I think to myself, "Buddy if this was Friday you'd be in trouble!" He milled around me for five minutes, headed into a grapevine thicket and found a doe to chase around. I hear a deer coming behind me. I watched the edge of the hemlocks and saw the little doe from this morning walking with her tail out and fluffed up...good sign!!! She walked right under me. I heard, "Uuuurrrrrrrppp", directly behind me! I knew right then it was him, he had a very deep grunt and it was always very short and sharply ending. Then I see a wall of tines, it's him! He stopped and looked around because of all the chase noise and then walked behind a big beech tree. I eased to full draw as he stepped into one of the few openings I have on that side of the stand. He STOPPED broadside at 6 yards! I ain't kidding, my mind said "Thanks for the memories sir", as the green pin was burning a hole through his lungs. The Wasp tipped Easton was gone as I watched the orange and green fletching disappear right behind the shoulder. He jumped ahead 10 feet and just walked southwest. My first thought was, "I know I saw that arrow go through his shoulder!" He walked about 50 yards, stopped, looked around and fell over. It was finally done! So much work, so much time, all the practicing, all the stand placement work, and the two year game of chess was finally over. I sat down and thought about all the encounters with him and what he means to me. How much I truly will miss seeing his footprints and hoping every time I check a camera that he will be on it. He will provide good table fare and provide me with a great mount, with a memory that will last my lifetime. It was probably one of the most somber times I have ever walked up on a buck I had shot with the bow. So many close encounters, so many pictures, so many hours looking at him with the field glasses, I kinda knew what he had, but didn't know for certain. I said a quiet thank you as I finally picked up his head for the first time and realized he was all I had expected and then some. He was heavy, and "minga" he stunk! This buck means more to me than any other deer I have shot, and Lord knows I have shot a pile of them. The start of the season last year I vowed that if I were to get him, it would be with my bow. All last archery season, gun season, and muzzleloader season I hunted with the bow. Thirteen encounters last year and it was never "right", so I let him walk. Man, did I catch grief from some of my buddies! I told them I had made a promise to myself that I would only take him with my bow, and that's what it would be or tag soup! I was fully prepared to eat the tag this year if need be, but willpower, determination, preparation, and attention to detail all came together at 4:45pm, on 11/15/10, from my favorite hemlock stand.